Using the Internet has many benefits for people. They can find information about health conditions and keep in contact with friends and family. The problem is that for some users modern computers are very difficult to use and understand. This is a particularly big issue for the elderly. 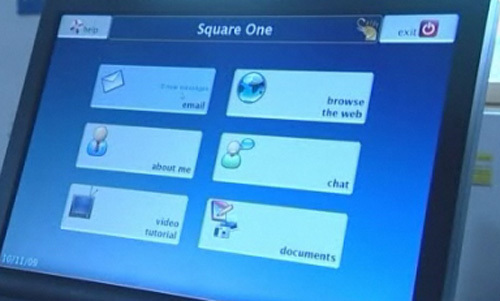 The square one screen gives users separate buttons that are clickable and takes them directly to functions like email, the internet, files, online chat, and a user profile. The email system used by the machine is a modified version of an application called Eldy. According to a survey by the Office for National Statistics in the UK conducted in August 2009, 6.4 million people 65 years old and over have never used the internet in the UK. The SimplicITy computer will be sold via a website called discount-age set up by TV presenter Valerie Singleton. Singleton will also be featured in 17 different video tutorials that come installed on the computers. Each of the computers will be built as they are ordered and the lead-time is said to be two weeks. The machines are developed in partnership with Wessex Computers. Once users are comfortable using the computer they can opt to stop using the square one start page and go directly to the Linux desktop.